A few weeks ago, LEGO teased us by saying that the largest Star Wars LEGO set ever would be released on October 1st. 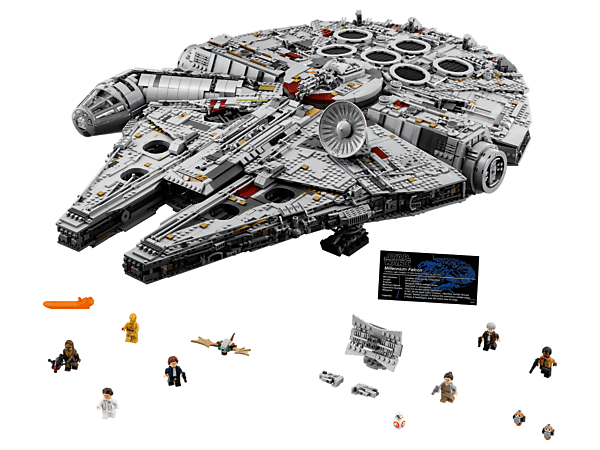 At the time, it was speculated that the set would be the long-rumored Ultimate Collector’s Series Millennium Falcon. As it turns out, all of the speculation and rumors were true. The set comes with four classic crew minifigs: Han Solo, Chewbacca, Princess Leia, and C-CPO. It also includes 3 Episode VII/VIII crew minifigs: Old Man Han Solo, Rey, and Finn, as well as BB-8, two buildable Porgs, and a buildable Mynock. Gunnery station features a minifig gunner’s seat and detachable hull panel with fully rotating quad laser cannon. An additional quad laser cannon is also mounted on the underside. This announcement definitely has the LEGO community excited, but what are your thoughts? Will you be picking one up? If you’re on the fence, remember that in recent years, LEGO has proven to be a better investment than both gold and stocks.